Happy Fall, Y'all!! It's my favorite time of the year and I'm so glad to finally be able to officially say that. There's so much to love about fall. Cooler temps, fall colors, boots and sweaters, football season, and pumpkin spice everything. 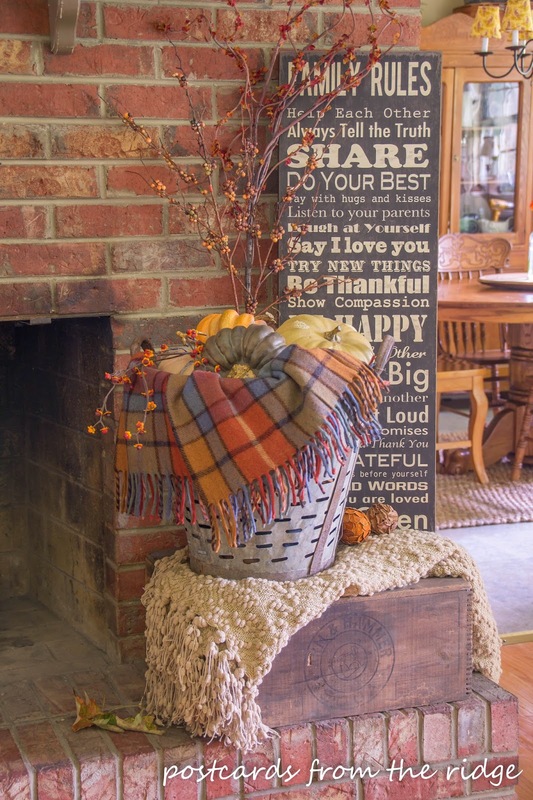 And adding fall decor to the house only makes it that much more enjoyable. 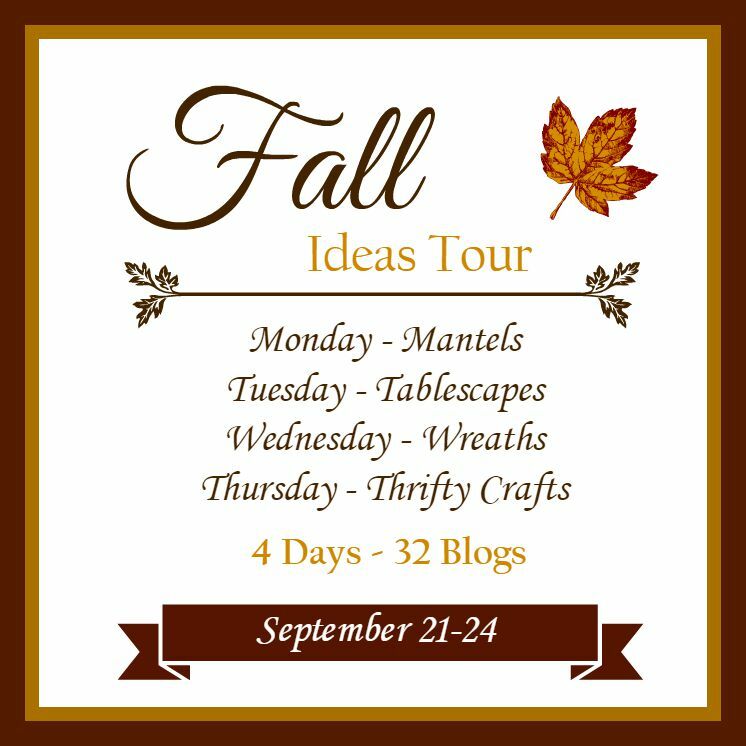 Today I'm honored to be joining with some super talented ladies and sharing some of our favorite fall ideas as we kick off the Fall Ideas Tour. For the next four days we'll be sharing tips and inspiration for bringing a bit of a fall feeling to your home. There are 32 of us in all, and some of your favorite bloggers are touring so be sure to check in with all of them for some fall inspiration. The superstar list of ladies is at the bottom of the post. 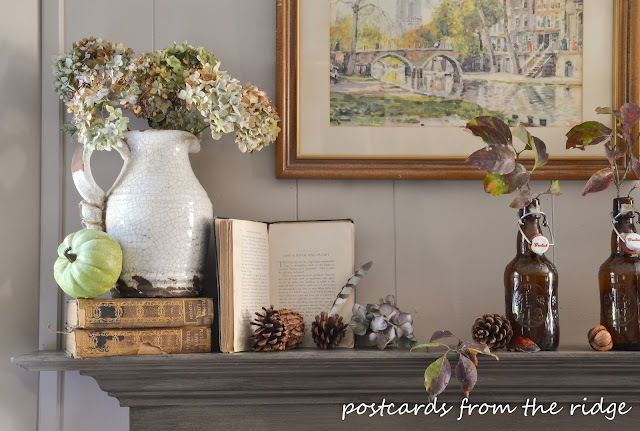 Today's theme is mantels, and I'm sharing some simple ideas with you and showing you how I decorated our family room mantel with mostly found, vintage items. Almost everything here was either free or found at a thrift store or yard sale. And it's quite an eclectic collection. I wanted to use soft, muted, fallish colors in this room and honestly didn't know where to start. The first things I decided to use were these vintage watercolor prints I found at a thrift shop a couple of years ago. I've always loved the colors in these prints. And even though I don't love the frames, they work with fall colors. 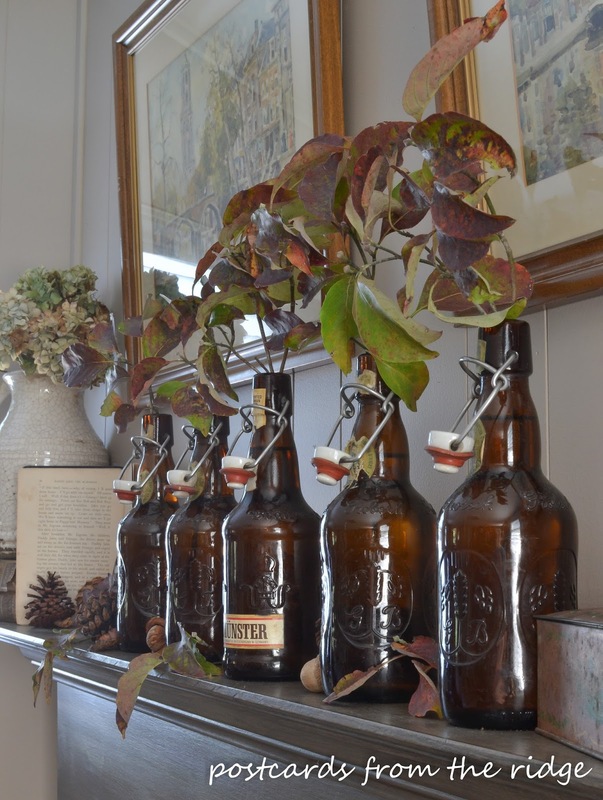 I knew I wanted multiple vases of some type to hold single stems or branches. I've got enough milk glass vases, but they were too white. Hmmm. 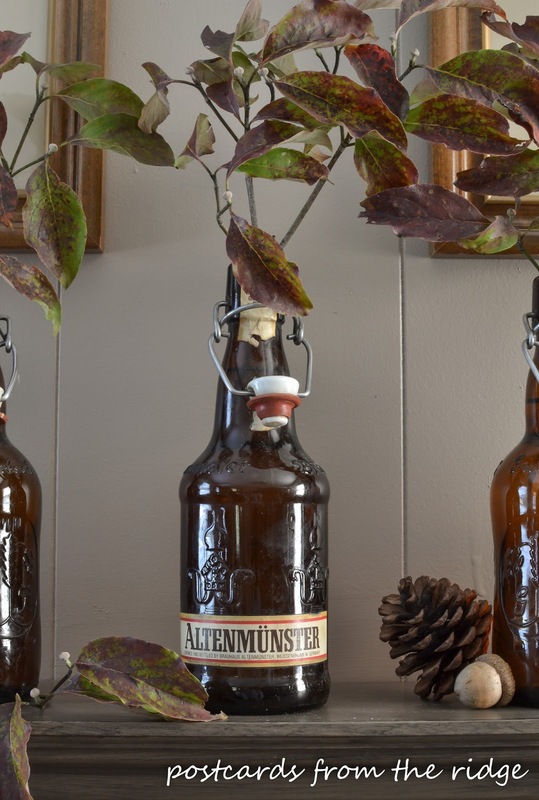 What to use....Vintage German amber beer bottles? Perfect. Different? Yes, but that makes me like them even more. I'm such a rebel (nerd), lol. One of them even has the original label. Sweet! And you know what makes them even better? They were free from a long time family friend who used to brew his own beer. He's in his 90's now, no longer brews beer, and needed to purge some items. Lucky me! I love dried hydrangeas (go here to see my simple method for drying them) and these looked perfect with the watercolor prints. And they were free. The pitcher came from Michaels last year and it's crackled finish has the perfect vintage vibe for the mantel. 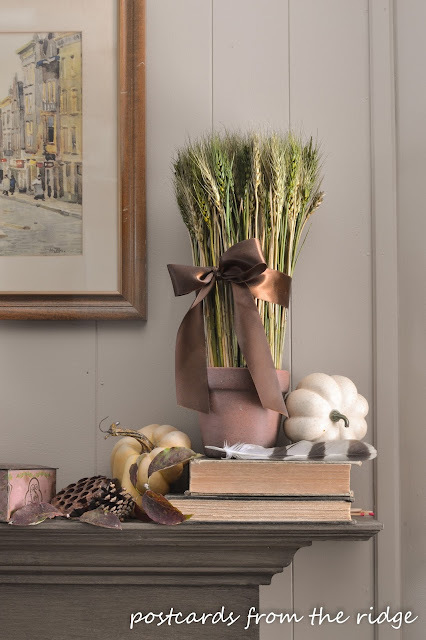 I bought the dried wheat grass from Home Goods 6 or 7 years ago and use them every year. I really like using natural elements whenever possible. And I found that cool striped feather while I was walking through the neighborhood a couple of weeks ago. Our dogwood trees are the only ones with any fall color right now so I clipped a few small branches for the beer bottle vases. All of my old books are from yard sales or estate sales. I usually buy them because I like the covers. And sometimes when I'm flipping through them I find chapters like "How a Witch Was Caught." Hmmm. I thought it was a fun page to open the book to since Halloween isn't too far off. And I found this little feather in the back yard a couple of weeks ago. It makes me want to go outside every day and look for feathers! Some of the few things I actually bought this year are faux pumpkins. I love the small white real pumpkins but they're not available here yet. I found these white and green ones at Michaels last week. And they were 50% off so of course I bought them. 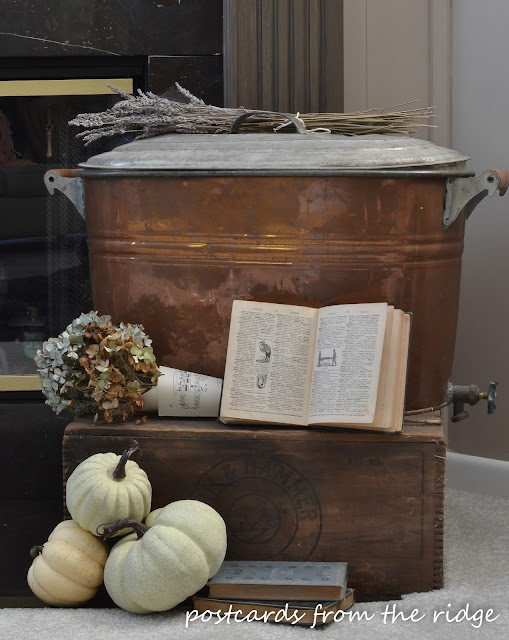 I've had the copper boiler and old wooden Arm & Hammer box for years. Another old book, this time a dictionary from the late 1800's. Almost every page has a sketch. Mr. Skeleton is perfect for this time of year. I added this funky mid-century modern office chair just for kicks. It was a freebie and I really like the shape of it. 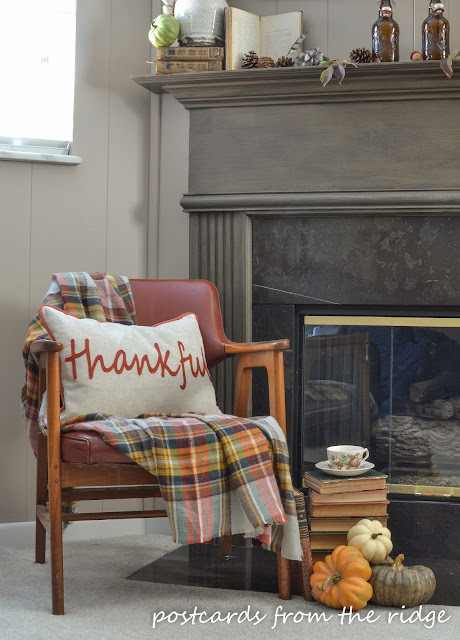 I did purchase the pillow this year and the plaid throw, which is actually a blanket scarf. I've been trying to revamp my wardrobe and was looking at scarves a couple of weeks ago and thought this would be a perfect throw. And honestly, I'd melt if I wore this as a scarf (thanks, hormones). 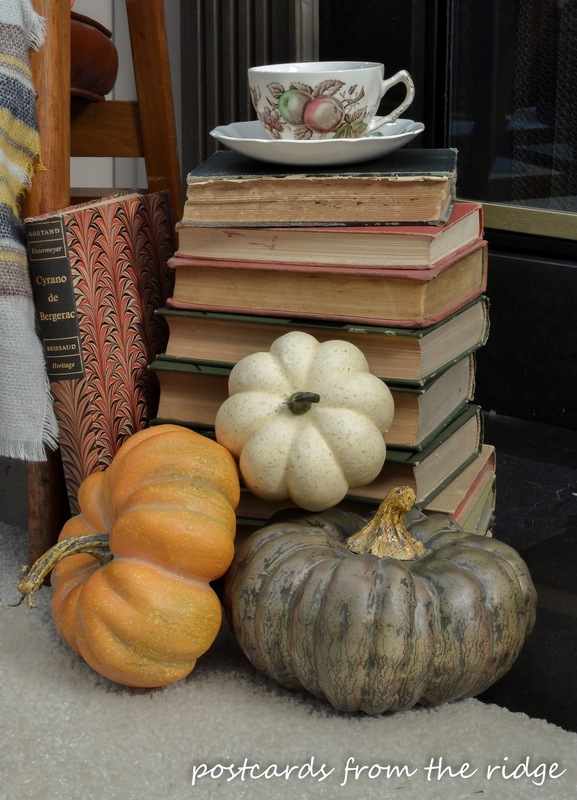 More old books and more faux pumpkins. I've had the orange and green ones for several years. 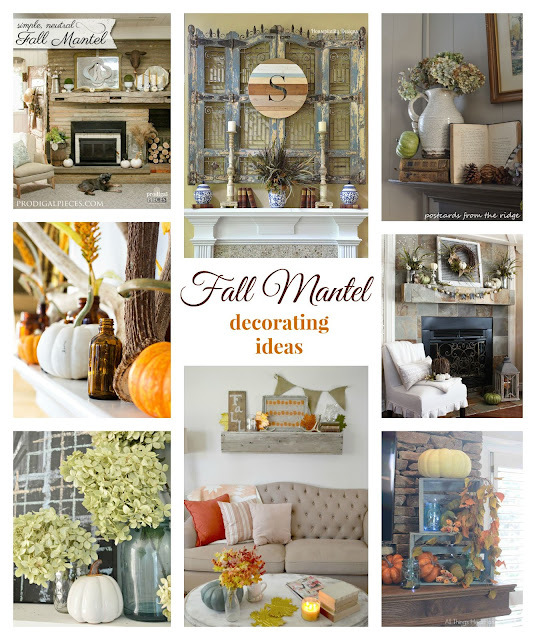 That's it for our fall family room mantel. I'd be lying if I said I didn't spend way too many hours trying to get it to look this way. I'm wanting to change out the black marble surround and hearth to something lighter, so trying to work with it when I dislike it was not fun. For now I'm just ignoring it but changing it is on my to-do list. Thanks so much for dropping by and visiting with me today. 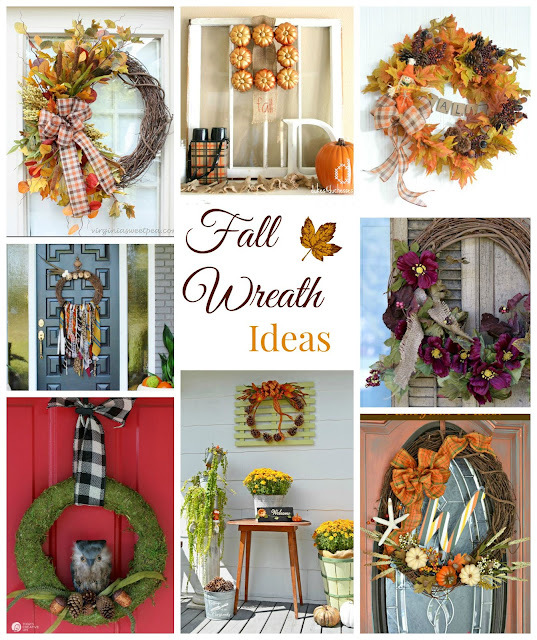 What's your favorite way to decorate for fall? To see our fall tours from past years, go here. 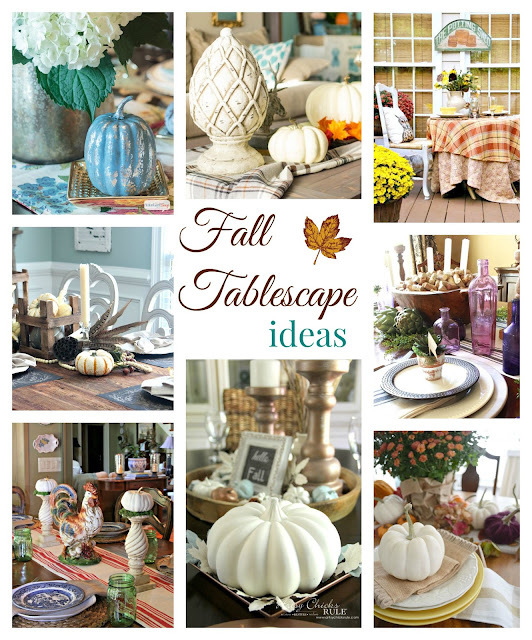 Don't forget to visit my talented friends and get some great ideas for your home. Scroll down for the list of daily decorating inspirations. To see my tutorial for how to paint paneling like a pro, go here. 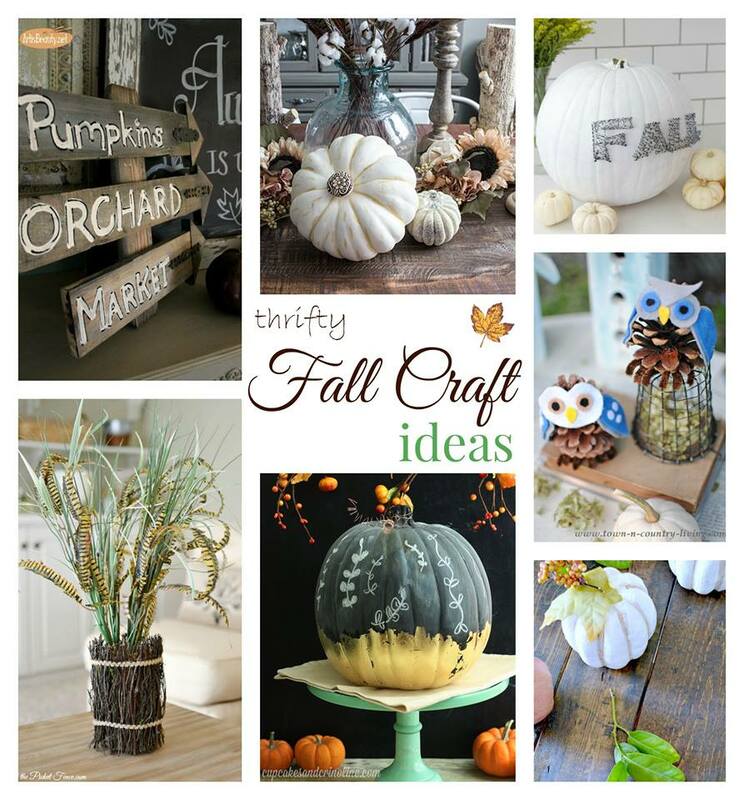 Go here to see more fall decorating ideas. And here are the links for the tour. Just click on the blog name to hop over and be inspired by all of the extremely talented bloggers in this group. Beautiful!! 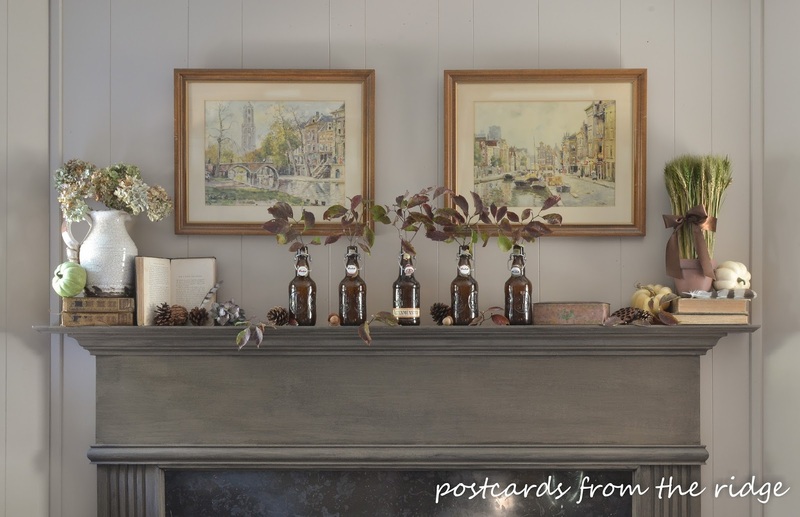 !...I love the vintage items that you used and those bottles are fantastic!....The hearth is styled so wonderfully and I must also say that I love the prints too! !...Great partying with you today! 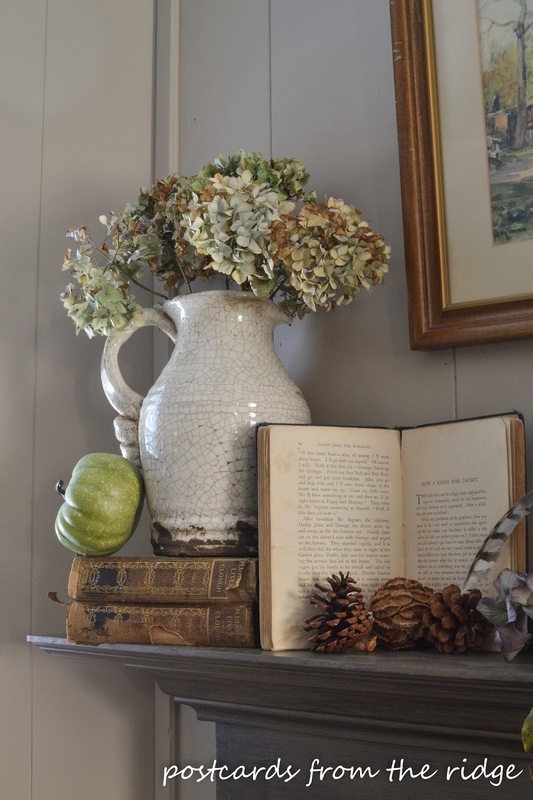 I'm loving all your vintage finds used on your mantel and below. 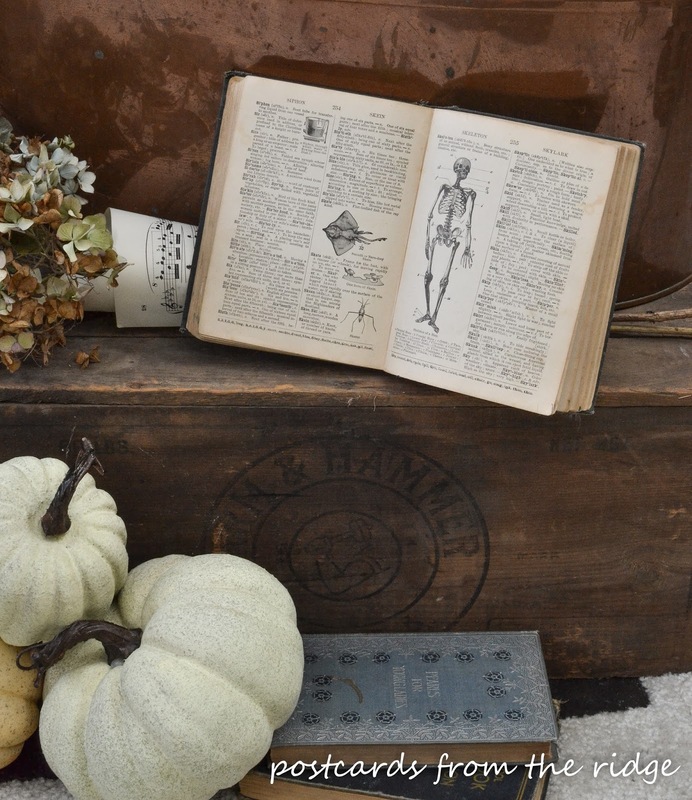 You've displayed your finds and collections so wonderfully, Angie! 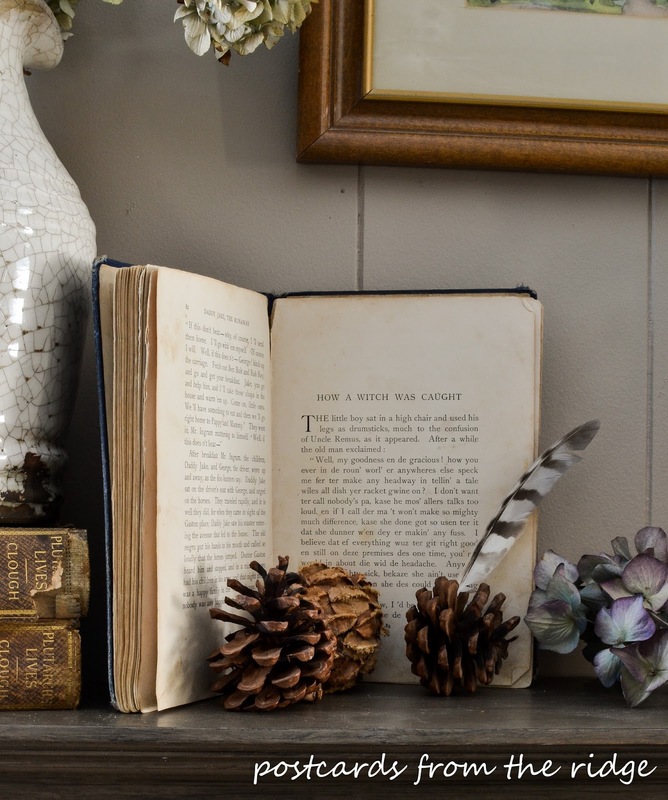 There's nothing like an eclectic display that says "Home". Beautiful and I need to start looking for old books! Great finds, love all the natural colors. Angie, I love how you decorated your mantle for Fall. Those old German beer bottles are fabulous!!! Love the old books, especially that you've displayed them open. I hear you about that pretty scarf being too warm to wear, but it does make a lovely throw. I love your mantel. LOVE I tell you!! It's got such a wonderful feel... I am getting the vibe right through my screen. Adoring the textures and the timeworn flavour. It's wonderful!!!! I love those bottles and Mr. Skeleton. 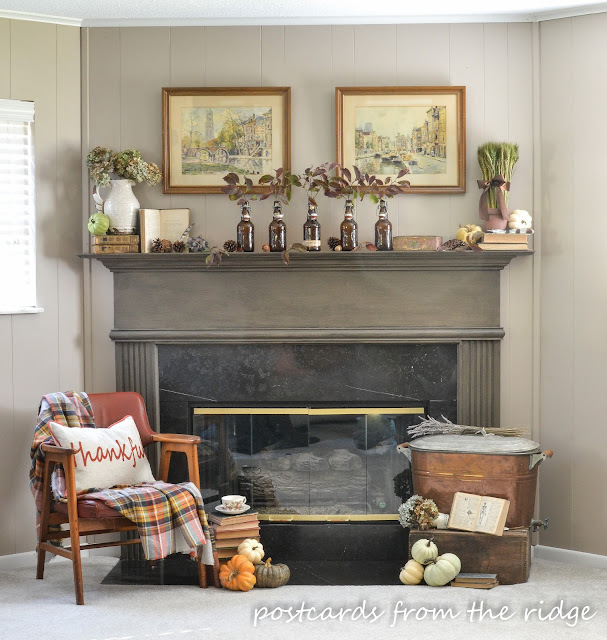 What great finds, and a gorgeous mantel and hearth! I think it looks fine! Sorry about your hormones!!! Although you don't like your mantel it looks great to me! Isn't it awful how long it takes to put something together so it looks like it is just "thrown" together? You did good!!! Love your mantel and vintage decor. 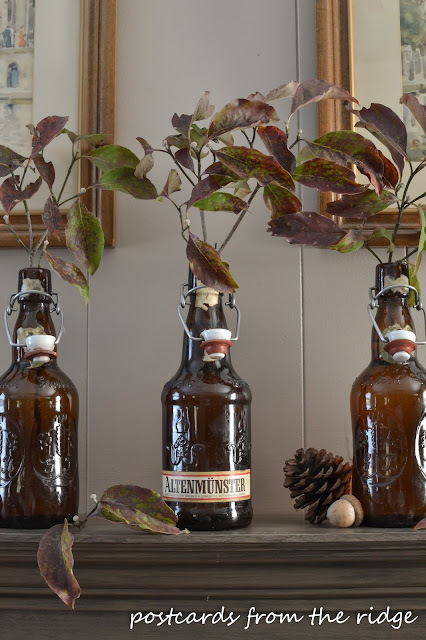 We especially love the setimental bottles and where you got them! I love the beautiful, subtle fall colors that you've used on your mantel and the story about how you acquired those vintage beer bottles! Getting lots of inspiration today as my mantel is still BARE! So pretty... love the brown bottles, books, feathers, pumpkins... well just everything... it's just perfect! Beautiful Angie! I love the amber bottles. My dogwood has lovely color now too. And I always like the old books in your displays. I LOVE your mantel Angie!! The colors, the watercolor prints, the green...all so fabulous. Angie - The beer bottles are perfection! I love the open books...so wondering why I don't do that!!!?? Beautiful! Beautiful, Angie! Your style is exactly what I like. The first thing that caught my eye was your prints. They were a great thrift store find! 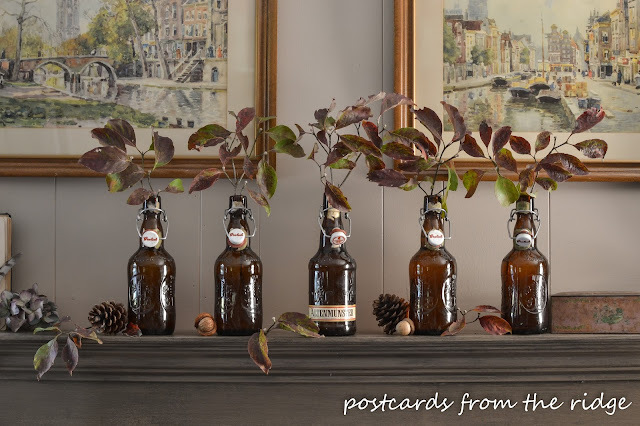 Using vintage beer bottles is a great way to add some brown to your mantel and also add interest because not everyone has ever seen something unique like these. I honestly love it all! Absolutely, positively gorgeous!!! Love every bit of it! 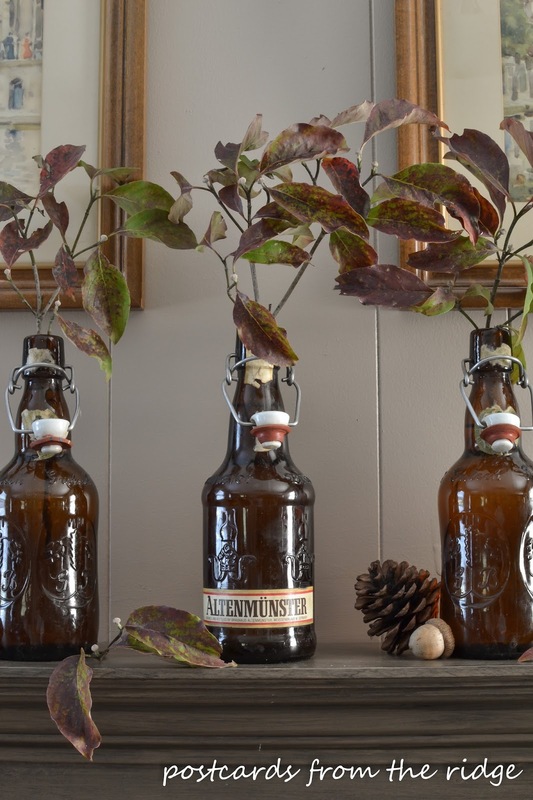 Those antique beer bottles are perfect for Oktoberfest season! Gorgeous mantel, Angie! I share your love of vintage books and love how you opened them to pages applicable to the season! And those amber beer bottles are sheer perfection! Lovely! I like how you displayed the open books. They are especially unique given that they are opened to special pages for the season. I love everything about it! The colors, the balance and everything you used!